Add a touch of spooky to your Free Comic Book Day this year with the first chapter of Ben 10and Big Hero 6 creator Steven T. Seagle and New Yorker Magazine cartoonist Jason Adam Katzensteins Camp Midnight! Not wanting to please her step monster, reluctant Skye is dead-set on not fitting in. But when shes accidentally sent to the wrong summer camp - Camp Midnight, where everyone attending is a full-fledged monster - Skye realizes that not fitting in will be the very least of her challenges! 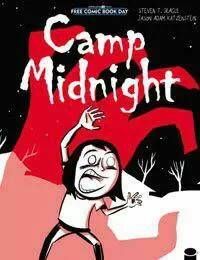 Camp Midnight is the perfect book for readers who love Raina Telgemeiers Smile but wish it had more bowls of gooey eyeballs in the lunch scenes.